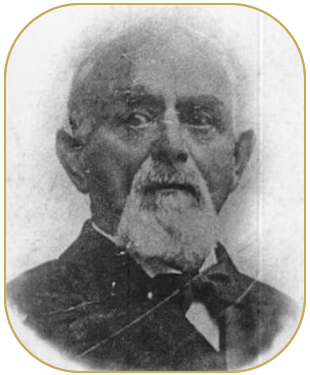 Born Jacob Youphes in Riga, then under the Russian Empire, little is known about the man until his immigration to America in 1854 at age 23. He arrived in New York, assimilated his name to Jacob Davis. He bounced around working various trades in Maine, San Francisco, Weatherville, and then Canada in 1858 where he met his wife and had six children. In 1867, Davis returned to San Francisco, this time with his family. In 1868 they moved again to Reno, Nevada to help set up a brewery. Finally in 1869 he returned to his original trade and set up a tailor shop on the main street of the town and was a regular customer of Levi Strauss wholesale imported dry goods. In December, 1870, Davis was asked by a customer for stronger work pants, suitable for a woodcutting. Davis used heavy duty duck and denim cloth, purchased from Levi Strauss, to strength key stress points in the jeans and also used copper rivets to reinforce the stitching. Demand became so high, and Davis so well understood the potential at hand, that he took his idea to Levi Strauss in a letter in 1872. On May 20, 1873 US Patent No. 139, 121 was the first pair of "blue-jeans" patended under Strauss and Davis, both. Eventually the more common brand designs came along, such as the two-horse logo in 1886 and the red tab on the left rear pocket in 1936 designed to better help identify official Levi blue-jeans from a distance. Following the grand success and high demand, Davis followed Strauss to San Fancisco for bulk production, ultimately leading to Davis managing a large manufacturing plant for Strauss. He continued to develop new work garments for Strauss and died and ultimately successful life in San Francisco sometime in 1908.